Hey, would you look at the time? It’s getting late. Just two months until the deeply introspective blog posts start comin’ hot & heavy. It’s still only mid-October, I know. Halloween decorations: in. Pensive rumination: out. But hey, I caught myself thinking last night, I’ve finally caught up with the bookkeeping (thanks, Jess! ), and I’m, you know, in the middle of a product launch… so why can’t New Year’s deep thoughts come early this year? I’ve got a lot of deep thought, but mostly I’m interested in the numbers. Yes, the money. Money money money! 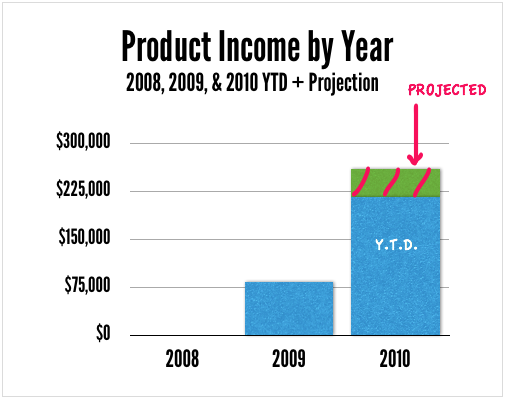 In 2008, my income from products was $0. Then 2009 was… well, let’s not go there. But this year! 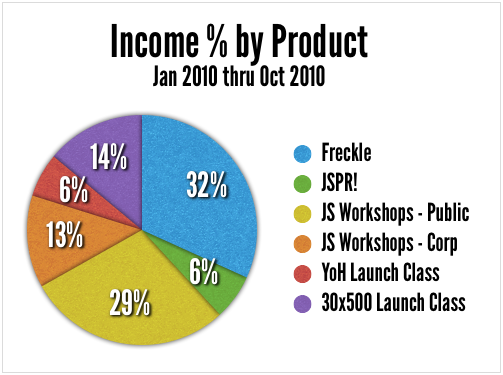 The income from products (sorta) made it possible for me to quit consulting in January 2010. I say “sorta,” because my products weren’t making enough to support me by January 2010. On the other hand, consulting was driving me batshit insane. So I took a look at my extra savings (a megapayment from a contract from hell), looked at my flagging products, and decided that dammit, I’ll make it work. I decided that, come hell, high water, or income tax audit, I would figure out how to earn enough from products alone… enough that I’d never have to pour my creative heart out for a client ever again. I thought it’d be fun to share the numbers behind the products I’ve made with my husband, Thomas; with one of my very best friends, Alex Hillman, and by myself. I know you’re skimming past all those annoying words and going straight for the digits. Hi. Hello. They’re right here. Hot diggity, that’s not too bad: $216,688. Actually, that’s a bigger number than I even thought. That money’s not all mine – happily. I’m not a lone wolf. I’m a very sociable wolf who loves to hang out and hunt with a pack. (Okay… backing away from wildlife metaphors now.) That is, I don’t like working all by myself, even when I could do everything on my own. I like to work with other people because it’s fun, because it results in a better product, and because, honestly, I like sharing the wealth. The new, improved reincarnation of that class, the 30x500 Launch Class does have material in it that Alex created, but is being run almost entirely by me. Do not include costs. All numbers are gross – that means I haven’t deducted operating costs, including transaction fees, server upkeep, freelance help, advertising, affiliate/partner shares, etc., etc. May be a bit odd because of conversion rates. Some, but not all, of our training courses were paid for in Euros. I converted them to USD with a rate of $1.30, a reasonable average. In fact, I’m trying to roll most of the Freckle income back into making Freckle awesome-r, but that’s another post entirely. Just the year-to-date numbers don’t tell anything like the whole story. A business is like a living thing: over time some things grow, others shrink. Following that slightly squicky metaphor, if my business were a body, Freckle would be the nose and ears (growing with age) and JSPR! would be, uh, something that shrinks over time. Height? Dignity? Neuroplasticity? JSPR! earned about $30,000 in 2009 (when it was new). It’s only earned half of that this year. We haven’t done many updates to it, and we haven’t pushed it much, either. This decline is natural, expected, and nothing to mourn. 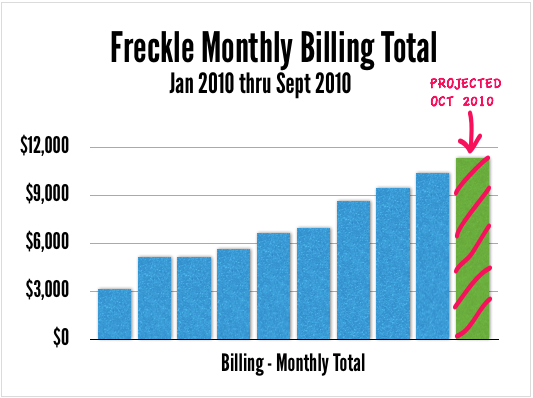 Freckle, on the other hand, was earning about $3,300 a month in January. If constant, that would have added up to, let’s see… $29,700 in earnings to date, instead of the $70,952 that actually happened. 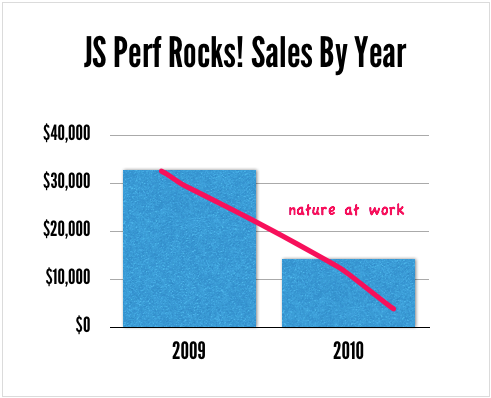 But when I quit consulting, I started spending a whole lot more time on it, and it’s grown quite nicely since. This month I expect we’ll just barely miss squeaking into the $12,000’s. For all the training income above, there were 3 corporate workshops and 11 open-to-the-public ones. The windfall income from these is fairly small but the reusability is very high! 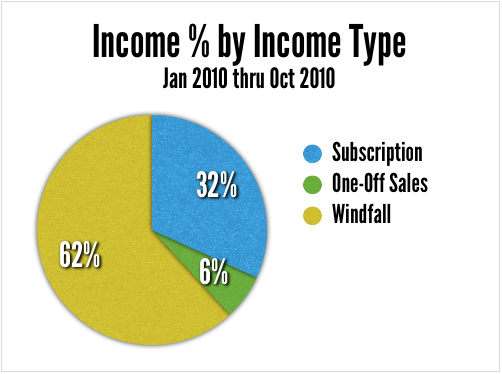 As you can tell, windfall income actually has made up the lion’s share of that large, tantalizing number. I wouldn’t want to live off windfall income alone. But it’s really kickass for helping fund our lives while we work on growing Freckle (and building our next SaaS subscription product, Charm). I’d like to grow the subscription income. A lot. Almost all of my work on Freckle lately is either promotion (by myself and working with freelancers), or expanding features (designing features/improvements; finding, onboarding, coordinating with freelancers). Delegating is hard. In Nov or Dec-ish, we’ll be shipping the private beta for our next SaaS, Charm. Charm is a bigger piece of software than Freckle, with more that could go wrong, but it will also be able to command a higher price. I’m going to create more self-guided learning products, and do less live training. The on-going trickle of product sales (like ebooks) is sooo much less work… and Freckle & Charm are going to require a lot more attention soon. So, Act I is to finish pimping & run my Launch Class. It’s almost 70% sold out so that’s good. Once I can stop fretting about those last few seats, I’m going to spend a few days brainstorming on what kind of self-guided learning products I could create. I’m going to take a long hard look at what tech/biz things I know, am learning, or have been teaching, & figure out which ones would distill well and sell well. Then I’m going to make one or two of ’em for the new year. Am I never satisfied? Why earn more? Money is a tool for me — I want more money to hire people full-time, to pay for some boutique development work I want done, to do a few personal things I want to do. I want to be able to work with my dream team (and they don’t come cheap). That sorta thing. Other than that, it’s all about the joy of the chase. I want to make a difference in the way that software is designed, and the way people work. Money is a fun way of keeping score, and a way to fund the things that can make those goals happen. How About You? Are you on your way to product-based income replacement? Do you want to be? Why or why not?